More than half of the public in England does not believe the NHS offers choice, a survey of 1,077 people has suggested. Patients have been given the option of different hospitals for non-emergency treatment since the start of this year. But the British Medical Association (BMA) poll found 55% did not believe there was a choice - and many thought hospitals were the wrong target area. The BMA also said it would fight redundancies as it emerged the deficits crisis had cost doctors their jobs. 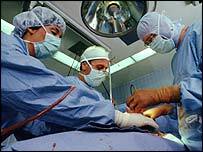 Two surgeons have been made redundant at the Oxford Radcliffe Hospitals NHS Trust, which is facing a £33m deficit. A trust spokeswoman said one of the major causes of the financial pressures was a lack of funds from central government, pointing out that the county got less funding per head than the national average. Thousands of NHS post closures have been announced in recent months but these have been mainly confined to nursing and non-clinical posts and have tended to be managed by recruitment freezes and early retirement. BMA chairman James Johnson said: "We will do everything we can in our power to make sure doctors are not made redundant. "We do not have enough doctors; to make them redundant is a waste." Speaking ahead of the BMA's annual conference in Belfast on Monday, Mr Johnson also criticised the government's approach to patient choice. At the start of the year, patients were given a choice of at least four hospitals, one of which could be a private centre, for non-emergency surgery. This was expanded last month to include 32 foundation hospitals - run by elite NHS trusts which have been freed from Whitehall control - and 15 private clinics specialising in minor NHS surgery. But Mr Johnson said ministers had been wrong to place so much emphasis on hospitals when in many areas the question of choice was academic as there was only one local hospital. In the poll, 69% of people said choice was very important in relation to "having a say in things generally" and "timing of treatment" - compared to 50% who cited the place of treatment. Mr Johnson said: "There is clearly an appetite among the public to be given choice and for having a say in the NHS: in particular for those who have long-term conditions. "But I think they [the government] were wrong to place the emphasis of choice on hospitals." 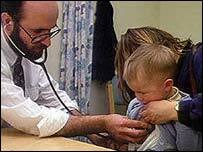 Dr Hamish Meldrum, chairman of the BMA's GP Committee, said he thought patients were being offered a better service. "The old idea, where you just went to the doctor, and the doctor told you what the treatment was going to be, and said go and get on with it, these days are long gone. "Patients are much more involved in discussions about the treatment, the alternatives they have got, what the risks, side-effects and the chances of recovery are and such like."